It's "opposite day" at Westgard Web. Instead of teaching you how to stay in compliance, control and adhere to the "Westgard Rules", we're going to show you how the rules get broken. In the start of a new series, we're going to quiz your knowledge of QC charting. See if you can spot all the errors, all the broken rules, all the outliers, and diagnose what problems might be occurring. We'll start off easy, with just one control and one set of "Westgard Rules" Data and charts are available for your inspection. Plot it for yourself or use the provided graphs. See if you can identify all the errors. Which "Westgard Rules" are being broken? Check your charting skills. 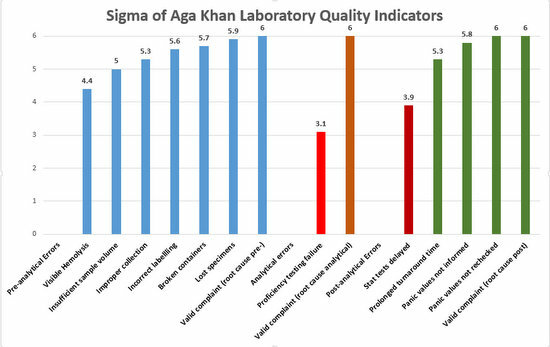 A recent study from the Scandinavian Journal of Clinical and Laboratory Investigation details the quality indicator performance of the Aga Khan University Hospital in Karachi, Pakistan. This is a Joint Commission International accredited, ISO 9001:2008 certified facility. When they looked at five years of data across the total testing process, they found some unexpected results in the frequency of errors in the pre-analytical, analytical, and post-analytical phases. R. Neill Carey, PhD, colleague and great friend of Westgard Web, provides us an overview of the latest update to the CLSI guideline on method verification. Booth 1665: Your destination at Atlanta's AACC/ASCLS! This year's Westgard QC booth will have two great raffle prizes, in addition to the "usual" Westgard Wear.